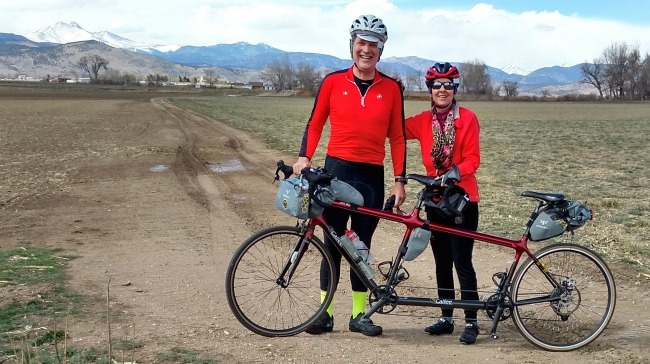 In between snowstorms here in Boulder, we’ve been stepping up our bicycling trips on “Hot Rod,” our new carbon fiber Calfee tandem. I’ve risen to what Porter calls our “Chocolate Croissant Challenge,” a trip in sometimes sub-freezing weather to a coffee shop in a neighboring town. 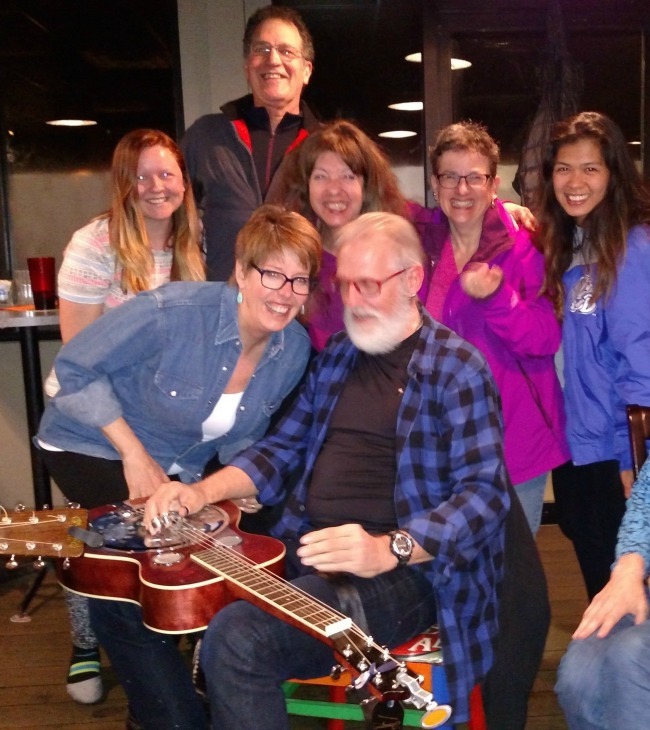 In no time we were ready for our first overnight of the season–to Lyons, Colorado to hear our friend Gary Koenig play in a bluegrass jam at Oskar Blues! 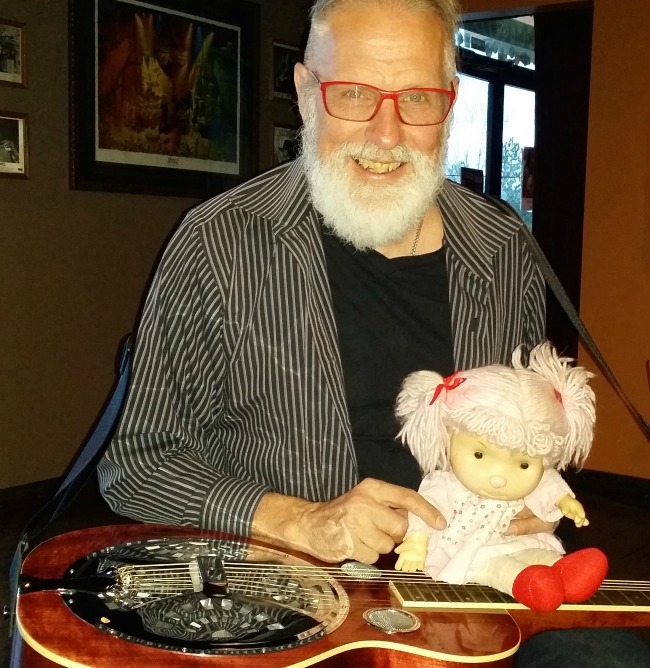 Gary is much admired for his playing of the Dobro, by his fans and friends, fabulous wife Peggy, and musicians jamming on guitars, mandolins, banjos, violins, and bass. Amber not only belts out the bluegrass songs with the musicians, but insists that Gary teach her how to play the Dobro. After a rowdy night of bluegrass music and adult beverages, Porter and I stay overnight at the cozy Aspen Leaf Motel, right out of the Fifties, complete with turquoise refrigerator, dinette set, and picture wall calendar. We pedal home the following morning. 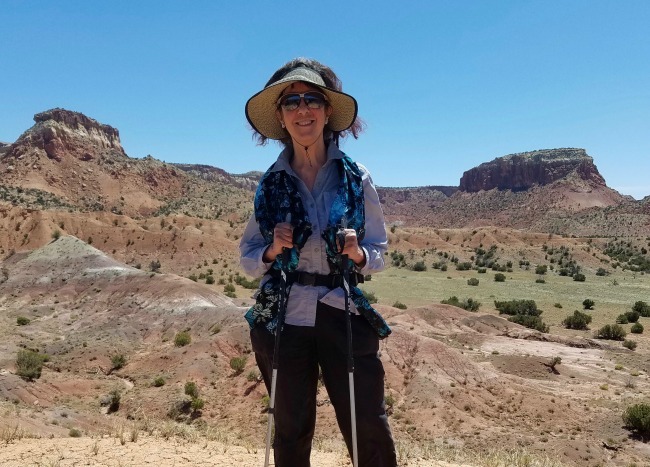 Continental Divide Trail #1: Porter Retires to Hike the CDT! I’ve wondered what you guys were up to since you are totally absent, Gail. Enjoy the rides. You two are so cute in your matching red outfits! Sounds like great fun!! Brenda, Happy Birthday! We’ll toast you tomorrow with love and gratitude for your friendship! Happy Trails & Tandem Biking! Hi Ina, wonderful to hear from you! 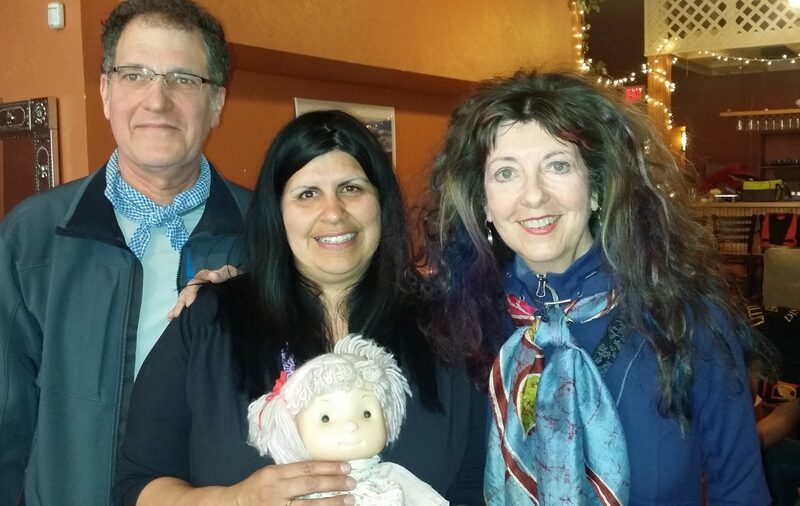 I recently met a friend of yours and Frost’s–Jeni Umble, I think? She’s in the group photo in this post with Gary Koenig and fans. 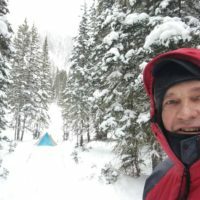 Porter is planning to hike the 800-mile Colorado section of the CDT this summer from north to south that we had to pass over because of the snowpack last May. I’ll be his support person as I was last summer. 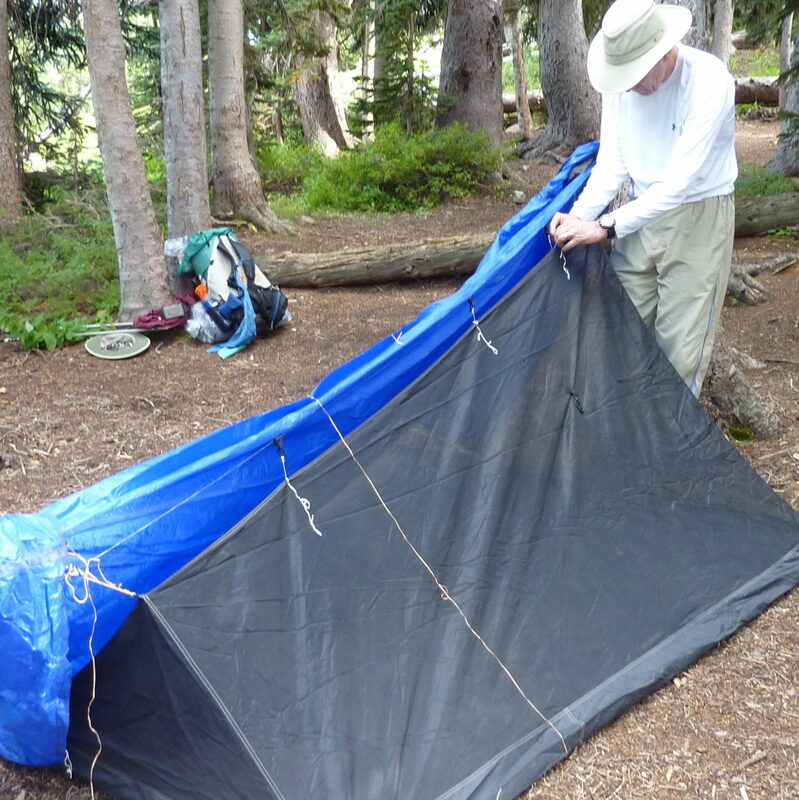 Happy trails and hiking to Frost as he continues from Rawlins to Canada–we know he’ll make it! 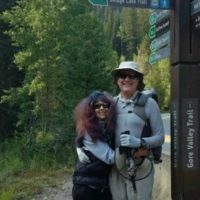 Gail, how was it compared to hiking where you each carried your own load. 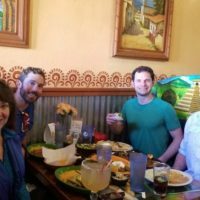 I did a self-contained trip last year in Oregon and a couple rode a tandem. Hi Ed, each carrying our own backpack is different from loading our gear into panniers on our tandem, for sure! Congrats on your self-contained Oregon trip! Porter and I biked on our previous tandem from Houston to Maine then Houston to San Diego, fully self-supported with our panniers. Wow, live bluegrass would be a good motivator for me, too!! Nothing like a snowstorm or subfreezing temps to make one feel alive. Good for you guys! Deb, Congratulations on your retirement from Lee Metcalf, and warm wishes for all the adventures you have ahead! You guys are such fun!!! Jerrie, and there’s been so much snow! Fortunately we made it back to Boulder before the snowstorm started. What a fun trip, Gail! I love the way you and Porter change up your routines. Thanks, Dawn, and hope all is great with you too! What a fun post, Gail. I drove that road a lot and remember seeing lots of bikers when the weather permitted. I’m most pleased that amber has found an outlet for her musical talent. Right on! Frank, I love thinking of you driving that beautiful road. The wind was out of the west so we really had to push especially going uphill, but we had crosswinds and tailwinds on the way home! Amber sends you her warmest regards, very much enjoyed your wonderful book, BEADS OF WATER: Finding Relief: Notes and Poems about Living 70+ Years with PTSD, and like me, looks forward to your next. Gail, in that part of my life I was involved in several arts and crafts activities and I would drive up that road on my way to the resources in Loveland. I would visit the Wood Emporium for hardwood (the owner was amazingly helpful), a glass-blowing studio, and in August, the Sculptures in the Park event. If you have not seen the sculpture exhibition, do give it a try. I never imagined that so many gifted sculptors are at work today. I do miss that part of the country. Fascinating, Frank! There are so many gifted artists in this beautiful part of the country. The beautiful weather between storms was wonderful and I’m glad to hear about your adventure in Lyons. Did you know I lived there for several years in the 90s? It’s grown a lot since then, but I still often rode my motorcycle over from Lyons just to have a soft-serve hot fudge sundae on summer days. My son Steve and his wife Linda always attended the Bluegrass events there when they lived in Colorado and I have one special memory of visiting Oskar Blues for dancing, music, and beer with Suzanne Venino and friends years ago. Now I have a vision of two dear friends in red riding their hot rod into town for an adventure of their own! I meant from LONGMONT to Lyons for ice cream! Rosemary, Yes, I was in that group organized by Suzanne Venino to go to Oskar Blues! We all took a chartered bus (maybe Banjo Billy’s?) together from Boulder and danced, sang, and partied the night away! I cherished that memory while we were at Oskar Blues this week. And I didn’t know you lived in Lyons in the 90s! I can totally picture you there! What a great idea for a trip!!! Thanks for sharing – and now what will you do until this snow melts//!!?? Beth and Phil, LOL! 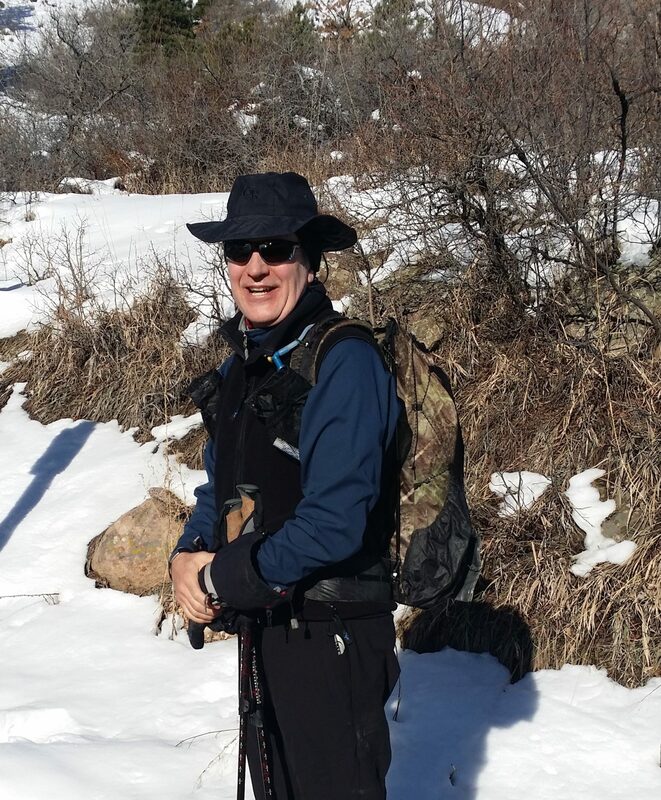 Fortunately we can still hike in this snow–our MicroSpikes help! 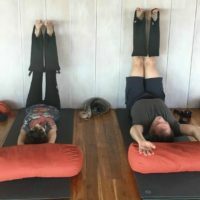 And of course there’s our Therapeutic Yoga class, which we love–at StudioBe in Boulder. Hope all is fantastic with you guys, and I’m sure you’re still riding your gorgeous horse! What a grand idea! I love following and being inspired by your adventures! I take the chocolate croissant challenge by going to Lucky’s Creamery & Bakery and resisting buying too many! Rivvy, your Lucky’s challenge is one I would lose, LOL! 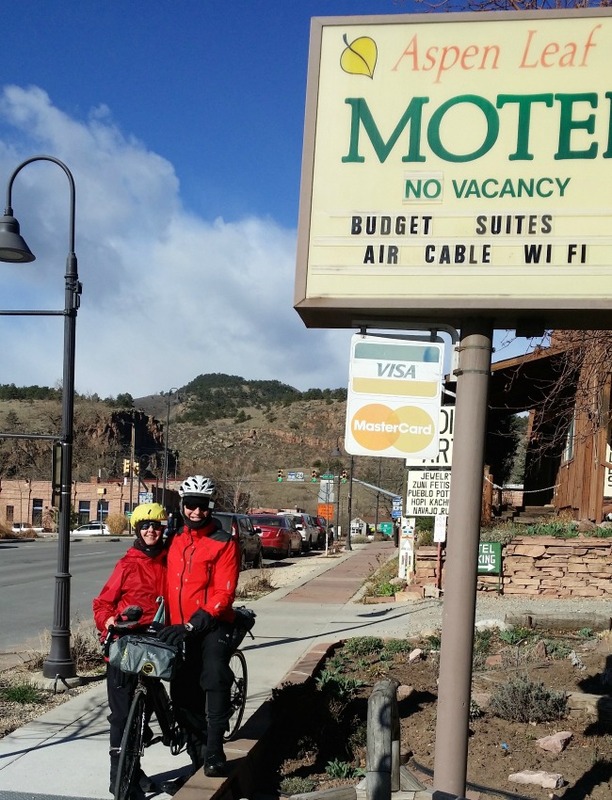 Thanks Porter and Gail for you tandem adventure, which all goes to prove that adventure is in the legs of the protagonists, not in the length of the trail. 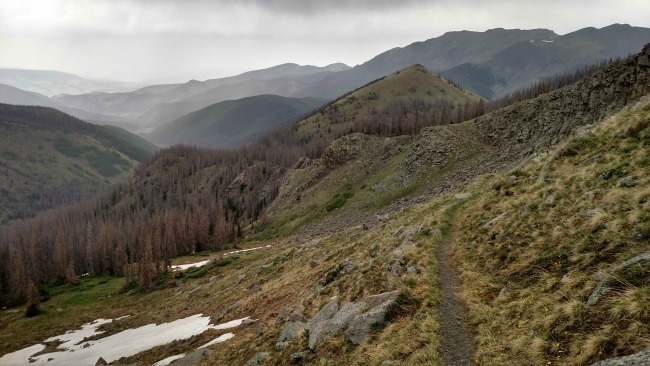 All the same, best to you on the last leg of the Colorado trail. . Keep us posted! And happy white Easter: I’m dreaming of a White Easter, just like the ones I used to know, where the tree limbs break off, and children take off to find bright eggs in the snow…. Pat, we shrieked with happiness and laughter over your splendid comment! Yes, a White Easter indeed! Much love to you and Hiyo! Fun to see! I’m glad you’re still out and about in spite of the usual March madness (the weather, I mean) I’m getting ready to do just the Mt. Adams section of the PCT this summer. My trail guide is so old I think a new one is in order. The tandem bike is a super idea. I like your destinations, too. We have the Palisade Bluegrass Fest here in June; the 11th or so. Come on over and ride the Fruit and wine by way and take in the music! Mary, I’m so excited for you about the Mt. Adams section of the PCT this summer! You are a continuing inspiration to me!Thanks for the heads-up about the Palisade Bluegrass Fest in June, will see where we are and what wants to happen! Your adventures are aspirational. Here in Houston, Ron has replaced his bike with a Ducati motorcyle – red, of course. I am trying to adjust. And always, we follow your lead into future fun travel. Joy, we can just picture Ron on a red Ducati! Maybe you could get one and be one of the women known for “Riding Her Own”!